Shoot, I totally lost track of our weekly postings for our Thursday cuppings -the weekend was crazy, we hosted a cookout for the coffee shops in the “burgh” on Monday night then traveled to Atlanta on Tuesday morning. Sorry Belloma! 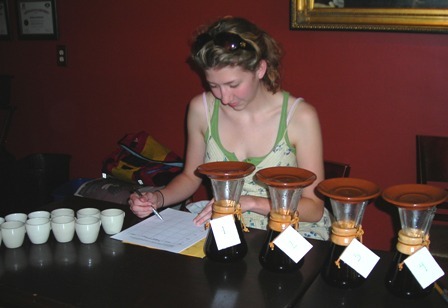 Our very own Rachel Belloma (we call her Belloma) was our cupping leader for this one. Rachel’s idea was to get us to explore different grind settings for the Chemex Coffee Brewers for our Brew Bar Menu. Belloma had us try four different grind settings using the Ethiopia Harar and she set this up as a blind tasting. We had to choose, in order, which one we like best out of the four. (BTW, one of the Chemex Brewers coffees was made with the appropriate grind too.) Interestingly enough, the whole group chose a grind that was a tad finer than what we normally use for our Chemex pots with our usual grind setting coming in second. Great experiment Belloma. So, on Friday I decided to try five different coffees in the Chemex Brewer. Five coffees ground at our standard setting and the same five ground at the setting the cupping group choose. This experiment validated what we thought – from coffee to coffee there was too much inconsistency using the finer grind and over all the coffees tasted better using our standard grind for this brewing method. But let me say this, our job is to find out from you your taste preferences. On some level we are trying to define a very narrow area and palate preferences. And in this area we hope to pass on our experience and knowledge with the coffee. We will maintain our standard grind for the coffees, but continue to offer you a choice in either the French Press or Chemex Brewers. Overall, the French Press will produce a more full-bodied coffee because it allows some sediment and oils to escape into the coffee and the Chemex will produce a very clean coffee due to the nature of the filters and the brewing process. Our baristas will guide you on which coffees they personally recommend for either brewing method. We didn’t cup this past Thursday due to our Atlanta Road Trip, but we are back on for this Thursday at 4:30pm . Rachel Walter is up next.